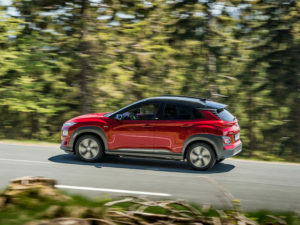 Hyundai’s Kona Electric will be priced from £24,995 – including the Government’s Plug-In Car Grant (PICG) – when it goes on sale on 2 August. Joining the petrol variants and forthcoming diesel model, the Kona Electric will be available in two variants: a lower-powered model with a 39kWh battery and 133bhp motor, offering an official 186-mile range, or a 64kWh / 201bhp model with a range of up to 300 miles. Styling changes compared to the regular petrol including a bespoke grille incorporating the charge point and a redesigned front bumper with active air flaps, along with dedicated 17-inch alloy wheels, lower side skirt and wheel arch side claddings. Trim levels start from SE for the 39kWh model and include a 7-inch display audio including DAB, Apple Car Play and Android Auto, rear parking sensors with rear view camera, Bluetooth connectivity with steering wheel controls and a leather steering wheel. Automatic lights, climate control, driver’s side electric lumbar support and keyless entry with start/stop button are amongst the key specification items. The 39kWh version is also available in Premium trim, which starts from £26,370 (including PICG grant) and throws in privacy glass, LED rear lamps, front parking sensors, auto dimming rear mirror and automatic windscreen wipers, 8-inch touchscreen display audio system with Navigation, DAB, Apple Car Play and Android Auto, combined with the KRELL audio system with 8 speakers and wireless charging for compatible devices. The premium trim is also available with the higher-powered 64kWh battery variant, priced from £29,495 (including PICG). The range-topping Kona Electric Premium SE 64kWh is available from £31,795 (including PICG), which adds in LED headlamps with High Beam Assist, static cornering lights and head up display. Additional enhancements over the Premium specification include leather seat facings, electrically adjustable and heated/ventilated front seats and heated steering wheel.